Cardboard Sports: What will Chip Kelly's offense look like? 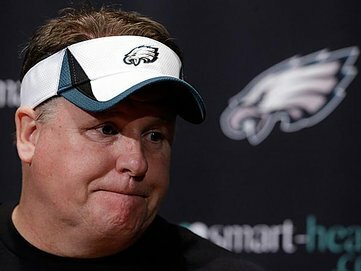 Eagle's head coach Chip Kelly has been charged with turning a team around. Ever since trading away Donovan McNabb, the Philadelphia Eagles have slowly gone from Super Bowl contenders, to jokes at the bottom of the NFC East. The bright side is that Chip Kelly knows how to run an up tempo offense. The Eagles have a lot of up tempo guys like LeSean McCoy, DeSean Jackson, and QB Michael Vick. The Eagles also have an option in young QB Nick Foles, who has the size and potential to be an above average quarterback in the NFL. Training camp is (finally) here, so let's see what Chip can do.